When a mouse walks into the trap, the trapdoor should shut. For this the trapping mechanism has to be sensitive enough, and made in such a way that it cannot be avoided by the mouse. The trapping mechanism itself is made out of a strip of aluminum, positioned in such a way that a small mouse cannot crawl under the strip. At Heslinga Traps every single trapping mechanism is checked and tuned by hand. Once caught a mouse will stick it’s snout though every possible opening to chew on tho aluminum. To avoid this, all openings in the Heslinga Trap have been kept as narrow as possible. A trap set in the grass can be difficult to spot. Someone might step on the trap. Often the aluminum can bent back into shape. To prevent any parts from coming loose, they are securely riveted. Spare parts are also available, should they be needed. These three things put together will insure a long lasting trap, which they have proven extensively in the field. A live trap is a complex product, but this does not mean that to much should paid. Buying hundred traps is a considerable investment for a consultancy or nature organization. By focusing on one product, keeping the organization small, and continued investments, Heslinga Traps is able to offer an affordable trap. Live traps are often used in openly accessible terrain. To prevent others from finding and taking your traps, good camouflage is important. 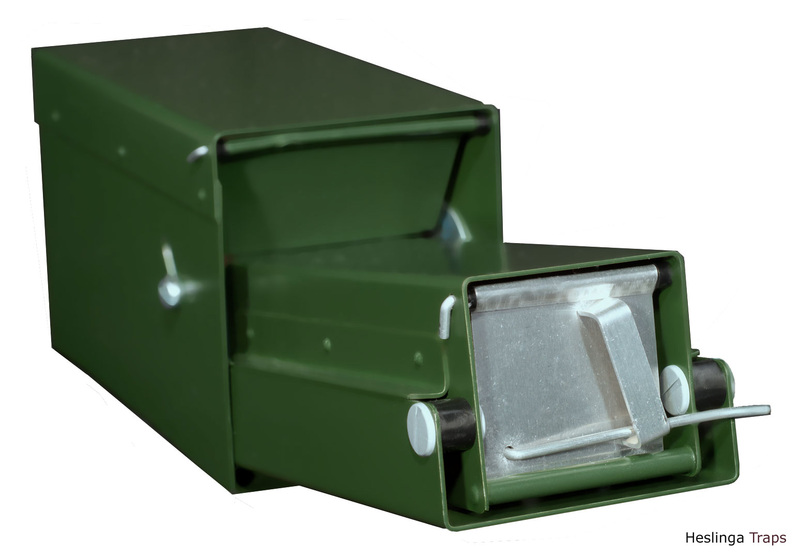 Thats why the Heslinga Trap is coated with a extremely durable green powder-coating. Aluminum is a difficult material to be coated. Aluminum traps which have been spray-painted by users them selfs often loose over half their coating in short use. The powder coating used on the Heslinga Trap is cured at 180 degrees Celsius, creating a perfect bond between the aluminum and the coating. Even when the coated aluminum is bent heavily, none of the coating will come off. Because the coating is applied as a dry powder, no solvents are needed, sparing the environment. Orders can be made by sending us an email. If you have a VAT number, VAT will not be charged, otherwise 21% VAT will be charged. All mentioned prices are without VAT. 50 or more live-traps are delivered in a free crate. Please contact us for shipping costs for your country. Live-traps are delivered from stock. For short projects live-traps can be rented from Johannes Regelink.